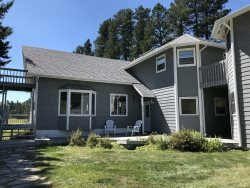 This home is located only minutes from Keystone, Mt. Rushmore and the 1880 train. Keystone Crossing has 3 bedrooms ( queen beds) with a bonus room which has 1 set of bunk beds and 1 full bed. It also has a full kitchen, washer & dryer, TV with satellite, AC, Gas bbq grill, 2 car garage and all the linens. Wake up each morning and watch the 1880 train pass by. This cozy home sleeps 10 with 2 bathrooms. When I had to call and leave a message the person got right back to me and was very helpful. We enjoyed the property very much. It was convenient and the right amount of space for our two families. Waving to the passengers on the train in the morning was a highlight. Rushmore Vacation Rentals. I will refer them to anyone planning a vacation in the Black Hills. They were friendly and fast. Rushmore Vacation Rentals went above and beyond to make our vacation great. We stayed at Keystone Crossing and the home had more than enough room. The home was clean and had all the amenities you need. WE were located right outside of Keystone and its a great location for all your Black Hills attractions. PS Loved the wild turkeys and deer in the yard every morning. I didn't have direct contact with the team, but the information emailed to us was easy to understand and timely. This property exceeded our expectations. It was homey, conveniently located to everything in the Black Hills and Badlands. We were a group of 6 friends and the layout of the home with the three bedrooms on one side and extra bedroom/family room on the other was perfect. It would have been helpful to have a couple of extra chairs that fit the kitchen table and we would like to have had a fire pit. Other than those items, it was perfect! The beds were comfortable, the additional outdoor chairs were appreciated as we sat outside enjoying the porch swing and watching bikes go by (as we were there during the rally week). The house was perfect and we will absolutely stay again. Great location for accessing places we wanted to see. Property sits near the road, but far enough away to allow plenty of room for kids to play. Beautifully nestled next to the hillside and surrounded by trees. It was fun to gather the children to watch the Hill City train go by and wave to the passengers. A large gathering of wild turkeys greeted us in the front yard. Was a lovely place to stay. Thank you!